Lots of little updates since my last post, so let's get started! The most exciting news (in my opinion) is that Mae has her first teeth!! She's been so drooly and chewing on everything, so we knew they weren't far away. I could feel the little ridge on her bottom gums for the last few weeks. Then, during her bath last Saturday, I was cleaning her gums with a washcloth and discovered that the first one had just popped through. Its neighbor appeared just two days later. 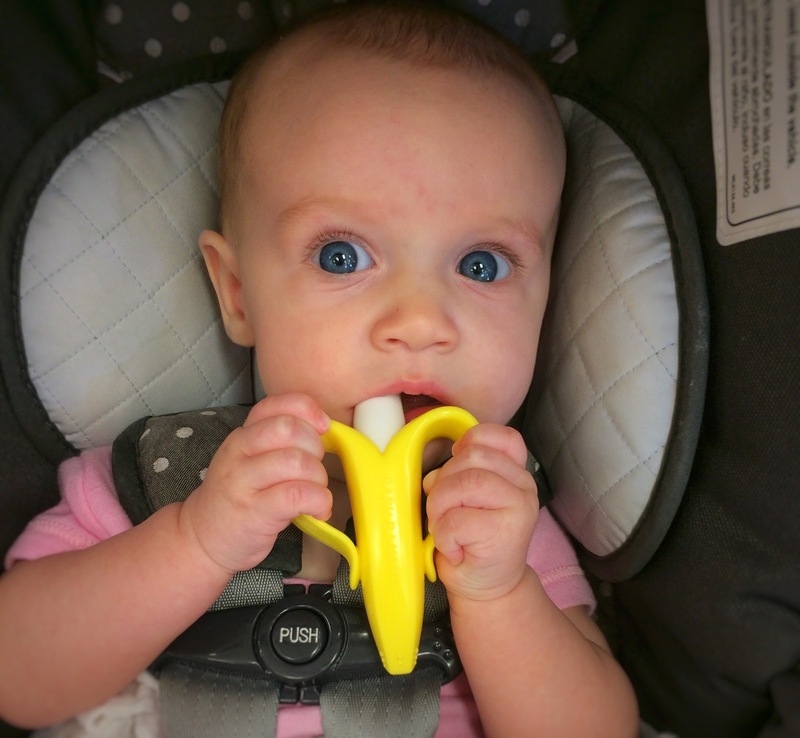 I bought her a little training toothbrush that looks like a banana. It makes me giggle, and she seems to like it. Also exciting, Dan and I celebrated our 4th wedding anniversary. This is the first year we haven't gone out to dinner on our actual anniversary since our first date 7 years ago! Instead I picked up Mae early from day care so we could cheer on Dan at our company's charity softball tournament. Fortunately, once a month Mae's day care stays open until midnight, so we took advantage of the September "Parents' Night Out" to enjoy a celebratory dinner out about a week belated. Apparently the traditional/modern gift for 4 years is Appliances, so I guess that new air conditioner was our big romantic present! 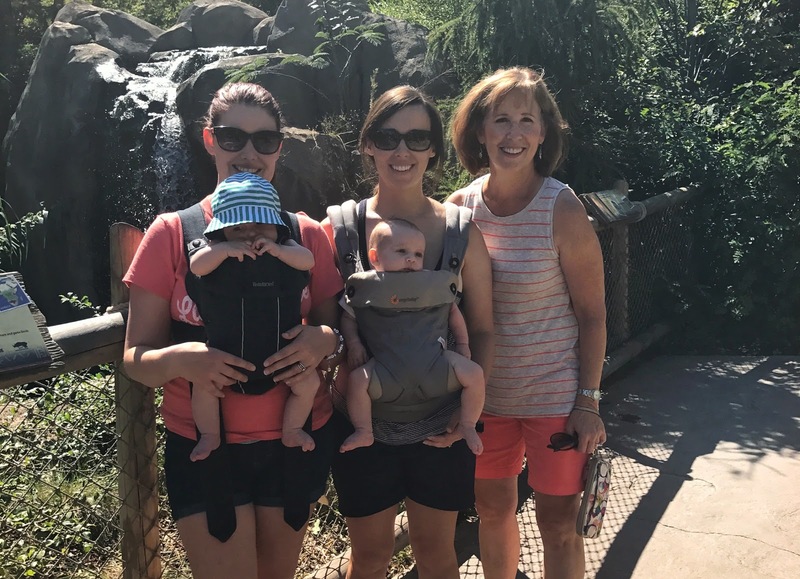 Last week, Mom, Emily, and Oliver visited and we went to the zoo. 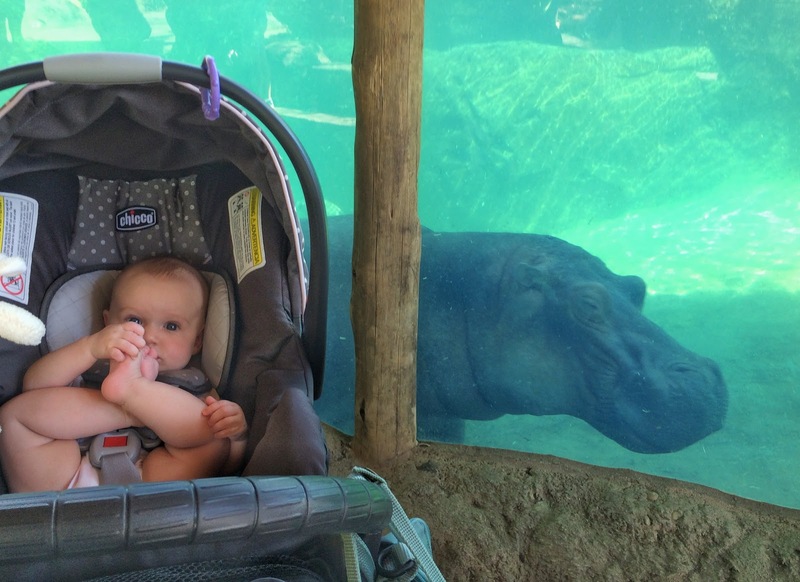 Mae actually stayed awake to see some animals this time, though she was more interested in her toes than the new hippo exhibit. Emily and I tried out our new front carriers and both babies seemed to enjoy looking around! Dan, Mae, and I got a chance to visit Ben and Jen's adorable daughter Anna who was just 10 days old. I got to hold her for a bit, and she even fell asleep for a few minutes! She felt so small even though she's the same size as Mae was at birth. It's fun to see how much Mae has grown compared to a tiny newborn! We also visited Courtney and John's house for Hank's baptism. He's a few weeks younger than Mae, but he is a giant! He looks like a baby sumo wrestler. He was so cute and very well-behaved for his baptism ceremony. Lastly, we had an appointment with a GI specialist for Mae. I felt better after leaving his office, even though we didn't get any new recommendations. I'm slowly adding foods like wheat and eggs back to my diet, but will probably keep the dairy and soy out until Mae is weaned. I'm sooooo looking forward to that first pizza. Mae has her 4-month checkup (and shots!) this week, so hopefully that goes okay! Thanks for the words of encouragement! I love seeing your updates of Abby on Facebook :) Dairy/soy intolerances seems super common for babies, so we are hoping she's in that majority that will grow out of it too. Ice cream sounds delicious right now. I found a coconut-based one that's pretty good but it's nothing like the real deal!